Having survived yet another night negotiating muddy roads with potholes a dog could drown in, the lorry drivers treat themselves to a hot cup of tea, a steaming plate of pre-breakfast food and flirt outrageously with the tea ladies. As dawn gives way to the day’s first sunrays, the market assumes a temporary lull. The trucks pack up and leave, the street sweepers begin their futile attempt at keeping refuse at bay and the stall owners set about arranging their merchandise with the freshest produce at the front. Yesterday’s and the day before’s produce is what you’ll get in your bag if you don’t keep your eyes open. 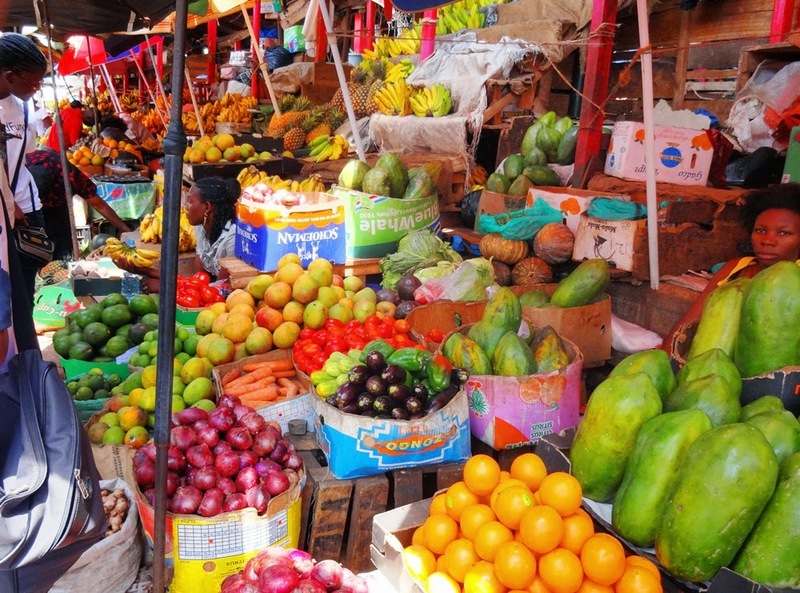 As a little girl, I loved trips to the market. I loved the market sounds and bustle; loud raucous laughter from a fat mama, titbits of gossip yelled across stalls, calls from stall vendors to come buy the best, the incessant cry of a demanding toddler duly ignored and the haggling. I loved watching people haggle. My close observation didn’t come to nougat. I learnt that: halve the price quoted and start from there. Each section of the market was unique. The vegetable and fruit section was my favorite. It smelt of ripe banana, jackfruit, mango and when in season, freshly fried crunchy grasshoppers. Heaven! The fish section reeked of fish and resounded with lurid catcalls from greasy fishmongers to voluptuous young women with pointy breasts. For a long time, I fantasized about karate and a rescue mission until I saw one of the girls smile and realized - they don’t hate it! My heroine ambitions were obliterated! The meat section filled me with as much trepidation as excitement. Large, grotesque carcasses of goats, cows and pigs hung by their legs on enormous hooks. A request for a kilo of meat saw a butcher in a bloodied white apron cut a chunk off and chuck it onto a weighing scale. DONE, OUT and on to ROASTING! I was and still am a ferocious meat eater. As I got older, haggling lost some of its luster but still, I haggled. It’s infuriating to buy something, walk 5 stalls down and discover you could have got it at half that price! On a relaxed day, it’s all rather entertaining, but there are times when all one wants is to get the goddamned mangos and go! As our holiday to Uganda wrapped up, my husband and I went out to buy the requisite edible souvenirs and Nakasero food market was our destination. Knowing the presence of a white man would quadruple prices, I asked him to go market touring (white people do it all the time), while I bought the pineapples. 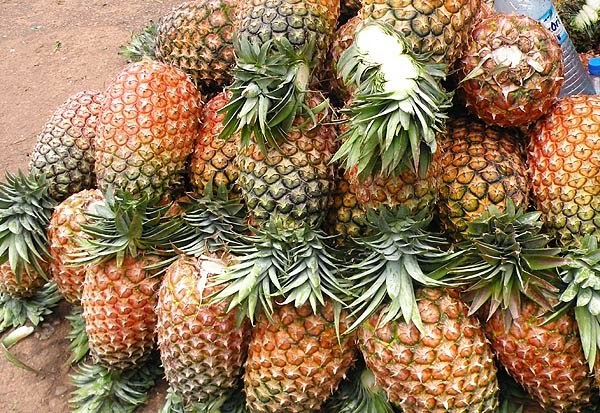 Having walked around and confident in my eye for the best fruit, I found myself at a heap of gorgeously ripe pineapples the size of your head. Surrounded by a group of jolly young male vendors and spoilt for choice (refocus please! ), I finally selected two and proceeded to put my haggling formula to good use. I paid with a large denomination bill and was waiting for my change when a white man came over and tried to buy a pineapple. I watched in amusement his futile attempt at imitating the bargaining mannerisms of a local in the hope of scoring a good bargain. The young men weren’t budging. To reel the white man in, they showed him the big note I’d paid with, pointed at me and insisted, "You see that madam there? That madam paid this big money for two pineapples only." One of them secretly slipped me my change and I played along. You could see the white man’s face slowly register disbelief. Thinking I’d actually paid that much for the two pineapples, the white man gave up all pretence, turned to me and asked incredulously, "Baby, did you pay all this money for those two pineapples?" Our cover was blown. The young men christened us ‘ninjas’ and I've no idea why. "You see that madam there? That madam paid this big money for two pineapples only."